The article lists 10 different video file formats and why they fail to playback properly on your Mac (Mojave included). Whatever the reason is, we'd always recommend an all-in-one tool for you to solve the problems. Furthermore, there're both step-by-step tutorial and video tutorial guiding you through the amazing Wondershare UniConverter (originally Wondershare Video Converter Ultimate). Description: AVI is a multimedia container that contains both audio and video data. It allows synchronous audio-with-video playback. AVI files support multiple streaming audio and video. Causes of Failed Playback: QuickTime does not support AVI natively. The codec (i.e. DivX) used in compression done on the Windows operating systems (or other systems apart from Mac) are not also supported by QuickTime. Solution: Try to install Perian (a QuickTime component) or other add-on/plug-in. Make sure that your QuickTime player is up-to-date (from QuickTime X to QuickTime 7) and is compatible for add-on/plug-in. Description: FLV, similar to other containers, is also used to store both video and audio data. The way it's encoded is very similar to the SWF file format. Causes of Failed Playback: The media file format is either invalid or not supported by the currently installed player. The other reason's probably that you have not installed the Flash player. Solution: You can download and install the Adoble Flash Player for every different browsers that you use, convert it to an MOV file format or playback using alternative video players. Description: SWF is a container commonly used to store animated or flash-based video graphics. It's preferred because the actual file size is very small. Causes of Failed Playback: If you haven't, you'll need to download and install the Flash Player/Shockwave Player for the browser/s that you use. It's the most straightforward solution. Solution: It can also be due to the browser's settings, extensions or outdated Flash player. Try adjusting the settings or update your player before going through the hassle of a file conversion. Description: WMV is a native file format introducted by Microsoft. It's naturally supported and made compatible with all of the Windows-operating or based system, program and software. Causes of Failed Playback: The main reason would be the video codec used for compression is not supported or recognized. Therefore, you'll need to download the required codec. Solution: Download and install the required codec - Flip4Mac component. If the problem persists, you might want to check out the recommended solutions. Description: MKV is an open source, standard container used to store a range of video, audio, image or subtitle in a single file. The WebM file extension also uses the MKV format as a basis. Causes of Failed Playback: QuickTime does not support MKV natively. On top of that, the file size is larger than other popular file format. The codec used to store the data is also commonly not supported. Solution: You can try to install Perian (a QuickTime component) or other add-on/plug-in. Make sure that your QuickTime player is up-to-date (from QuickTime X to QuickTime 7) and is compatible for add-on/plug-in. Description: AVCHD is a high definition video format commonly used for storing videos recorded on camcorders in the extension of a MTS or M2TS file format. Causes of Failed Playback: It's not within the list of supported file format unless you try to rewrap it or upload the file through iMovie (which automatically converts it into the AIC format). Solution: QuickTime can't playback the files that's stored in the memory card of a camcorder or the AVCHD codec. You'll need to either convert it to an MOV file or install the codec. Alternatively, try moving or copying the files over to your local directory and then right-click to open the files individually rather than the usual double-click. Description: The DivX can be used as a codec as well a container. 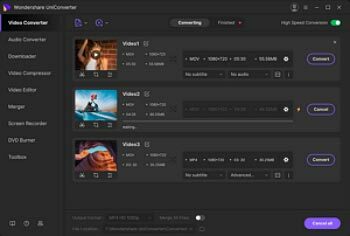 As an extension out of the AVI file format, it also supports multiple video, audio and subtitle tracks. Causes of Failed Playback: It's a matter of getting the right codec installed for a smooth playback. Otherwise, simply download another player that supports the file format. Currently, QuickTime does not support the DivX codec natively. Solution: Try to install DivX codec (a QuickTime component) or other add-on/plug-in. Make sure that your QuickTime player is up-to-date (from QuickTime X to QuickTime 7) and is compatible for add-on/plug-in. Description: MOV is a native file format introducted by Apple. It's naturally supported and made compatible with all of the Mac-operating or based system, program and software. It's also playable on iOS devices. Causes of Failed Playback: The data stored might have been encoded with incompatible codec. The other possibility is that you'll need to upgrade your player. There's also the chance of the file being damaged or corrupted. Solution: Before you come to a conclusion of ditching your current player, try to install the required component, add-on/plug-in (i.e. MPEG2 or Perian). Make sure that your QuickTime player is up-to-date (from QuickTime X to QuickTime 7) and is compatible for add-on/plug-in. Description: MTS is an extension that's commonly used for storing high definition videos recorded on DVDs or AVCHD camcorders. Causes of Failed Playback: Similar to the AVCHD, you'll be required to convert them in advance to an MOV or other compatible formats. The easier way out, however, is to use another video player that suppports the MTS. Solution: You can either download and install the required codec, convert it QuickTime-compatible formats or simply use a different video player that support the video file. 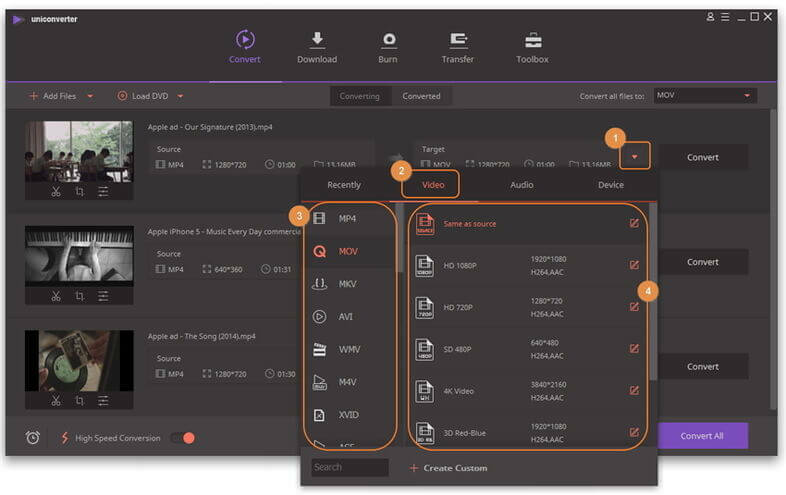 Description: VOB is a container that's used to store multiplexed streams of video, audio, subtitles as well as DVD menus and etc. Practically, all DVD movies are stored in VOB file formats. Causes of Failed Playback: It might have been encrypted or require additional add-ons/plug-ins to support the playback. Please also ensure that it's a video file and not burned as a data copy. Solution: The codec used to compressed the video file is not supported by QuickTime. In order to be able to playback the video file, you'll need to install the required component, add-on/plug-in (i.e. MPEG2 or Perian). Please also ensure that your QuickTime player is up-to-date (from QuickTime X to QuickTime 7) and is compatible for add-on/plug-in. The Wondershare UniConverter for Mac (originally Wondershare Video Converter Ultimate for Mac) supports a wider range of input and output formats. In addition to that, the ultra-fast, file conversion also consists of the best recommended or optimized settings. Other than the built-in editor, you can conveniently download online videos as well as create or burn a DVD using the same software. Step 1 The UniConverter (originally Wondershare Video Converter Ultimate) supports batch conversion, hence you can simply upload all the files that needed to be converted. All you have to do is drag-and-drop them onto the program. The files uploaded will be neatly displayed just as the screenshot shows. Step 2 If you want to edit the just imported video, hit the editing buttons under the thumbnail of the imported video. This all-in-one onverter provides you with clipping, cropping, merging and other functions. After editing the video, you can have an instant preview of your edited video. Just play your talents to make a video masterpiece. Step 3 Click the icon in the Target section to get a drop-down list, where offers a huge variety of supported output formats neatly categorized into Recently, Video, Audio and Device. you can select either based on the brand or model of your portable devices or specific file type. Step 4 Now just click Convert in the lower-right to start video conversion. You can also refer to the video tutorial below.